Did Thatcher Use Soldiers During the Miners’ Strike? I was recently involved in a Twitter thread concerning the use of troops during the miners’ strike. It has long been rumoured that Thatcher sanctioned the use of the army and that squaddies were dressed in police uniforms and let loose on picket lines, to aid in crushing the strikers. I think the first thing we ought to ask, when considering the question, is why such a tactic might have been favoured by the Tories and in asking the question we are immediately presented with some difficulty in providing a reasonable and plausible answer. Numbers of police, resources, intelligence, funds and equipment were all made available to the police without limits. It’s difficult to see why Thatcher would need to use the army to bolster the – at the time – forty-three separate constabularies which were coordinated as a national force. The large numbers of police used during the strike presented logistical problems for local authorities and there are documented instances of police being billeted at TA and regular army barracks. Perhaps the rumours started there? Additionally, it was very common for police officers to remove their ID numbers from their uniforms but it seems more likely that this was to prevent violent and corrupt officers from being identified, rather than any sort of indication that such people were soldiers in disguise, as was the common assertion during the strike. We know that police spies, agents provocateurs, Special Branch officers and MI5 agents were all used to combat the strikers and evidence has emerged to confirm such actions. But of soldiers dressing in police uniform we have yet to see even a single shred of real proof. Following the release of cabinet papers on January 3rd, 2014, we know that Thatcher was considering using the army in line with the recommendations made in the Ridley Plan, to move coal, breach picket lines and so on, but this would have been an overt action with armed forces in their own uniforms and acting with official state approval. Of course, the use of soldiers dressed as police officers is certainly possible and one shouldn’t, for even a second, doubt that the Tories would have baulked at such a tactic had they deemed it necessary. There is no question that the prime minister would have ruled such a move either in or out based on any legal or ethical grounds; it would have been a purely tactical and strategic decision. But, personally, I don’t think it happened. I’d still be very interested indeed in looking at any accounts people might have on this question, so please contact me if you feel you have something interesting to share. I was in the RAF at the time. A corporal working for me in an Oxygen Equipment Repair Section went to RAF Scampton on a course. He came back talking about all of the army personnel he had met in the NAAFI in police uniform trousers, who said they were going to the miner’s strike picket lines. 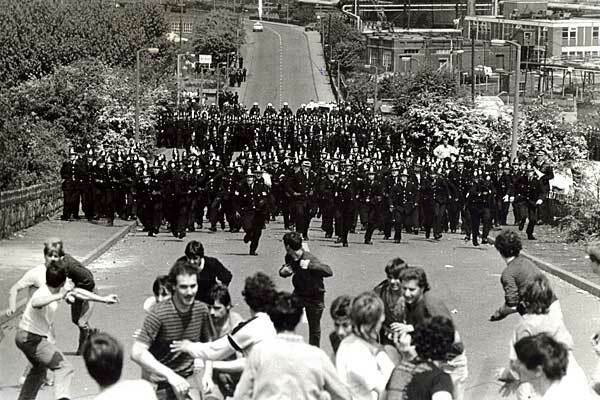 I was in the police and deployed to the strike in 84.. There were no Army in Police uniforms! – We were (mostly) well trained young men – we marched in formation and were drilled by ex-army RSMs – so yes, we looked ‘military’ but were were all definitely civvie police.. Thank you for your comment that the Civil Police were drilled by ex RSM’s; as I am not someone familiar with the internal Police culture of the 1980’s could you clarify the comment for me ? Were the ex RSM’s members of the Police or were they employed on a “consultant” basis ? What purpose did the RSM’s serve ? were they there as military advisors or to teach parade drill ? I live in the valleys and was told that Paratroopers was involved in the miners strike in 84. This was the reason for searching and finding your site. I was going with the Essex Ubiversity team to the national ultimate frisbee championship at Warwick University at Easter during the miner’s strike. At some point after joining the A1 we passed a convoy of buses, the buses were full of people in green boiler suits and there were police uniforms hanging in the windows. As we passed the buses we could clearly see the people in the green suits changing into the police uniforms. I have always assumed that these were members of the army being transported in military vehicles and that for some reason they were dressed in the military fatigues for purposes of anonymising the unit they came from. I have no evidence to support this belief but there must be many other people who were on the road at the time and will have seen the same thing with better knowledge of what was happening. I was working in the Knotty Ash Pub (Liverpool) during the Miners strike when footage came on the news showing police attacking miners. While I was watching this a customer who I had never met before, I think he was visiting someone in Alder Hey hospital, told me he was a docker and had seen his son dressed as a police officer in similar footage days earlier, he went on to say that his son was in the army not the police. He approached his son about this and he admitted it was him then added the mans other son was doing the same. He told me he had wrote his two sons off and was never talking to them again. So I just checked on the internet to see if anyone else was aware and found your page. I heard exactly the same story on a picket line in South wales in 84. Tony Bunyan in State Research / StateWatch documented the MACP (Military Aid to the Civil Power) framework which would have presumably been in place … It is said that Thatcher was particularly enamoured of the use of the use that was made of the SAS in the assault on the Iranian Embassy in 1980.